This could have been the shortest blog ever written. Pink lemonade. Just go to Can Dendê and have it. But although I was a fan of this place after the first sip, that might not be convincing enough for you, since you haven’t tasted it yet. So let me tell you more. 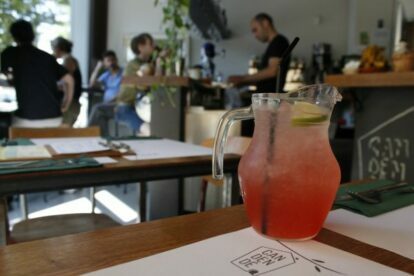 Can Dendê, named after the cute dog that walks around there, is a small brunch place in the upcoming area of Poble Nou. Truth be told, it is a bit off the beaten path and not in the most attractive street of this lovely neighbourhood. But it is the vibe and the food that are worth a visit! Never have I seen staff smile so proudly when you compliment them on their food. This place literally does everything with a bit of love, and you can tell. Inside it is the typical small, hipster brunch hot-spot with vintage furniture and a fresh look. They told me they will soon expand the terrace, for those sun lovers amongst us. But inside you will find a great spot with a view of the vibrant ambiance in the little bar! The brunch is one of the best I have tasted so far in town. (And I brunch a lot…) I can recommend the french toast, eggs benedict and…did I mention the pink lemonade? But really, whatever you order; something that’s made with the enthusiasm of the Can Dendê kitchen can only end up being super tasty!